hiermit laden wir Euch herzlich zum Sommerfest ein, welches dieses Jahr vom FSFBK und der Fachschaft Biologie organisiert wird. Das Fest wird am 20.07.2018 von 16:00-22:00 Uhr im Innenhof des Biozentrums stattfinden. Dort wird gegrillt und mit dem ein oder anderen isotonischen Getränk auf das Ende der Vorlesungszeit angestoßen. Mit diesem Sommerfest wollen wir wie jedes Jahr auch die BachelorabsolventInnen würdig feiern. Auch für Musik und die ein oder andere Überraschung ist gesorgt. Alle Getränke und das Essen kosten jeweils 60 Cent. 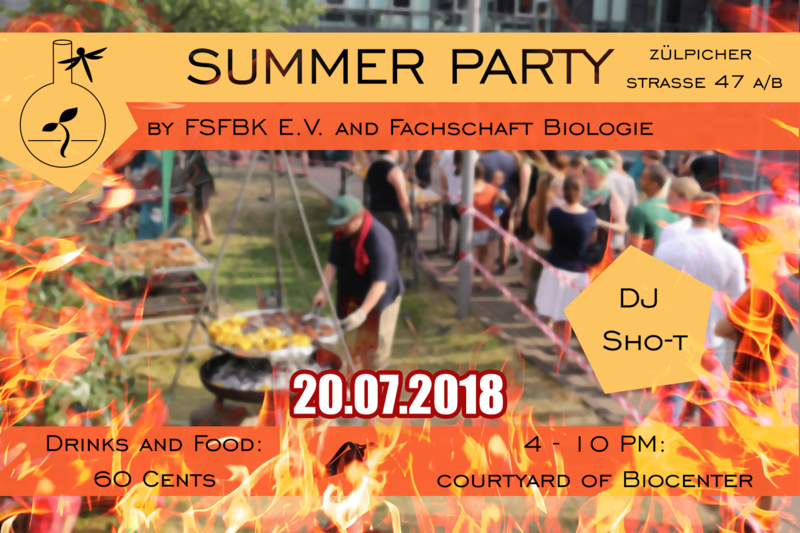 you are cordially invited to our summer party, organized by the biology student association and the FSFBK. It will take place on the 20th of July from 4:00-10:00 pm in the courtyard of the biocenter. We will provide a BBQ and cold beverages for you to enjoy. We also want to honor our bachelor graduates, as we do every year. Furthermore, there will be music and a little surprise - the perfect opportunity to celebrate the end of the semester with your fellow biologists. All drinks and food will cost 60 cent. We are looking forward to a great summer party with you!